Spooky setting. 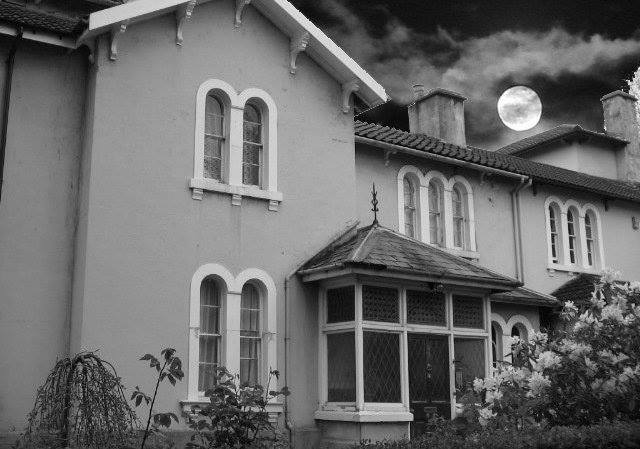 3 The Villas, Stoke, U.K., provides the setting for John Pye’s short story, The Vampire of The Villas (2013)—all the more startling, because it really happened! Picture: John Pye. Everybody has a local Public House, right? Well, if you don’t I will enlighten you as to what one would expect to find (beer-stained carpets, flags of the world) if you were to pop inside a typical English Pub for a small tipple. But, every so often this place of worship will change hands, meaning a new landlord and maybe a lick of paint so that next time you cross the threshold you are greeted with a décor that is more shabby chic than 70’s retro, West-London contemporary rather than a typical boozer. This is what happened to me when stepping into The Vampire of the Villas by John Pye. I half expected the usual crime thriller with two puncture marks and a mysterious death. Instead, I was pleasantly surprised and my thirst for new vampire novels and short stories has been gladly refreshed. I will tell you why. It was the eve of August 12, 2016. I was browsing my usual vampire-related social-network pages and happened upon something interesting, and more importantly, FREE! 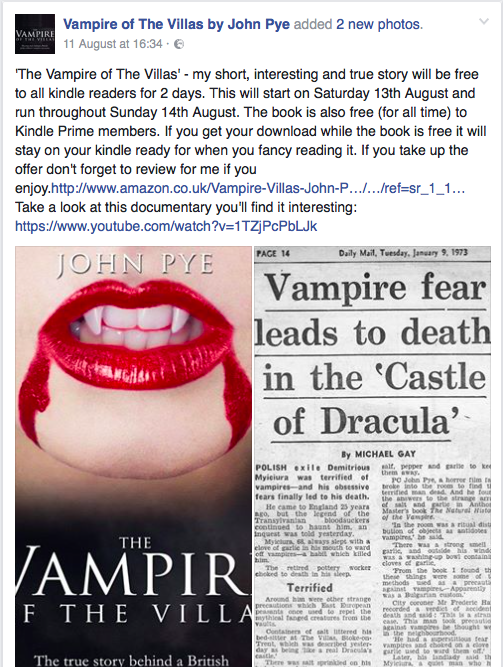 For two days only (August 13–14), Vampire of the Villas, a short but true story by English author John Pye, was free to download on all Kindle devices. So, I dug out my Kindle from its grave, ready for the weekend. Offer too good to resist. John Pye’s promo for his short story, The Vampire of The Villas. Picture: Facebook/Vampire Writers Support Group. This was a relatively fresh take on a vampire tale for me—possibly because the case was real and the author did not wish to deviate from the path of truth—and I enjoyed my reading regardless of the absence of fiction, ­which is something that I can’t say about many modern vampire writings (I’m sure you can think of plenty, without me adding to your list). The only things Victorian that were mentioned were the streets and the various buildings that inhabited them, which was also a breath of fresh air. Although, being set in 1972, a policeman did still wear a cape! I think though we can forgive the historical accuracy here and even praise the author for resisting any temptation to delve into the world of fiction to elaborate his story. This short story is about a particular case that “remains to this day the only one in Britain to have been accepted in a Coroner’s inquest as having a genuine connection between vampire belief and an actual death,” as Pye mentions in the story’s endnotes. It is about a policeman’s (John Pye—yes, the author’s) nightmare shift in which he doesn’t get to finish on time and enjoy a celebratory pint in the The Copeland Arms. Instead he is sent to check on an apartment in which it is feared the lodger, Demetrius Mykiciura, has died. John is given a Dracula-esque welcoming by a landlady with a foreign tongue before she leads him through dim light and a narrow corridor to his destination. Here a dead body is discovered, ultimately having perished due to a fear of vampires that Demetrius had retained throughout his entire lifetime. What happens next is that we are told about the various discoveries that the on-duty policeman makes in the victims room and during his own private investigations on the history of the vampire, all of which lead to this being the only case in England linking a persons belief in vampires to their own demise. I won’t spoil the story for you for it is only brief, what I will say is that John Pye captures that moment where our fiction and reality combine, resulting in a tale that must be told; made from a secret, lost by another. This short work has all the elements for vampire novel starter pack: a gothic mansion, a Slavic landlady, a helpless victim and a hero-like figure in the making. I didn’t want my journey through Stoke-on-Trent to end and wished that there were a further three hundred pages to go before it did. Personally, I believe the detail in describing the deceased is absolutely excellent and for me is the highlight of the read, “bulging eyes could be made out behind the closed lids” and “a groan issued from the man’s mouth.” I’m sure you will agree (when you download your copy), that could easily have led to the victim being diagnosed as a vampire himself, especially if he had been discovered in another part of Europe and a couple of hundred years ago. Vampire historians should marvel at reading this particular moment in the story, after all, it is an actual eyewitness testimony. New discoveries were also made for me about human feces being a vampire’s delicacy and sleeping with bags of salt under the duvet as a further means of protection enraptured me even more. With good humour throughout this book will take you no longer than half an hour to complete. A Sunday afternoon classic, it is a must. Or, we could end up noticing a tale that doesn’t need enhancing and tell it perfectly for all to enjoy. John is given a Dracula-esque welcoming: When Pye was received at the door by The Villa’s landlady and invited in, ” ‘Come,’ was all she said.” With only gleams of light for visibility and the sounds of bolts being drawn back one can almost mistake Pye’s entrance for Jonathan Harker’s rigid welcome in Bram Stoker’s Dracula (1897). when you download your copy: The story is currently available for free on Kindle Unlimited. The Vampire of The Villas is referred to as a “fictionalised account of the story” in Liam Barnes, “Only Death to Ever Be Officially Linked to Vampires in the UK at The Villas in Stoke Inspires Retired Detective John Pye to Pen New Book,” Sentinel (Stoke, U.K.), November 19, 2013, accessed November 25, 2016, http://www.stokesentinel.co.uk/death-officially-attributed-vampire-uk-villas/story-20099531-detail/story.html. archive.is link: https://archive.is/g9mo9. 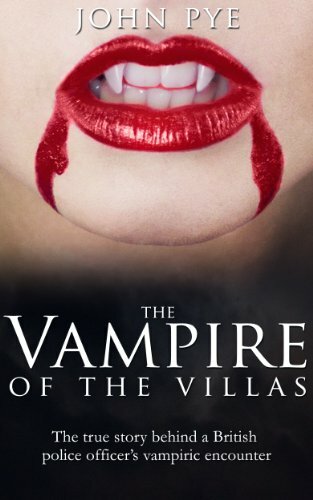 The Vampire of the Villas is available on Amazon in Kindle format. You can also “like” the short story’s Facebook page and visit Pye’s website: http://www.cathedraloflies.com/.